The copyright section appears at the bottom of the left column on p. 3, with the table of contents above it. There's no credit for a general editor ('Chefredakteur'), only for vice editor Wolfgang J. Fuchs and various department editors. 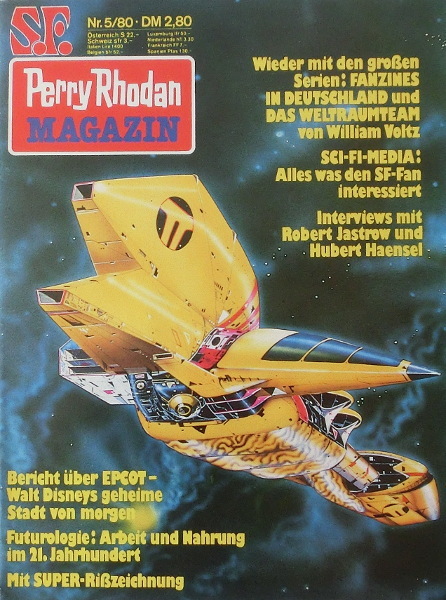 sci-fi-media is credited for this entry from its own copyright section. The extra pages are notated here with Roman numerals. The serial instalment is inserted after p. 24 in the middle of the magazine (paginated 1-8). Inserted into this (after p. iv) is a poster (p. ix), which has on its back 4 pages of 'sci-fi-media' (pp. x-xiii). There are some ads, but only p. 48 is a pure ad page. The illustrations by Stoessel and Storchi are miscredited (Bernhard instead of Bernard Stoessel) or uncredited, respectively (Storchi was identified by his signature).